BT, Nokia and Qualcomm team up at MWC2018 to show how 5G NR is changing the way viewers will experience sports events. Sporting events are in a state of transformation. No longer are event attendees content to simply be passive viewers. They want access to additional views, extra content and real-time updates and information. And they want to be able to share pictures and videos with their friends and family as the event takes place. Fans also want the same experience delivered to them at home or on the go, as if they were in the stadium. Ultra high definition content, augmented experiences, new interactive applications, and social media are changing the way we interact with friends, other fans, athletes, coaches, and businesses supporting our teams. Nokia and Qualcomm’s recent 5G Consumer Survey cites faster data speeds and response times as key motivators for adopting 5G, with the ability to use cellular connectivity seamlessly and virtually everywhere to deliver lightning-fast browsing as well as stream UHD and 360° video content. At MWC18 Nokia and Qualcomm Technologies are working with British Telecom to demonstrate how 5G NR is enabling this transformation of sporting events. The unique features of 5G NR are allowing the BT Sport division to look at using the technology as uplink delivery of multiple 4K video cameras recording different angles at a sporting event. While some larger stadiums are adequately pre-wired with capacity to serve the high-def cameras, many other facilities and locations are not equipped to handle this type of traffic. 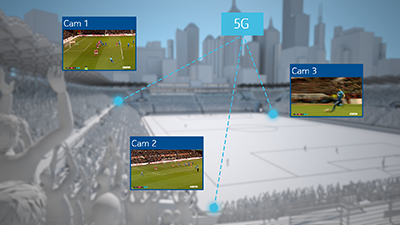 The 4K camera feeds delivered over the 5G NR system include overall game footage, individual player feeds, bench cam view, and views from other locations. These are delivered to a Cloud Mixing Facility where producers manage sending the content to end users. The demo at MWC18 features an end to end 3GPP based 5G NR system in which BT Sport, supported by their technology partner ATEME, are using multichannel video to stream multiple cameras footage over our live 5G NR end to end system in Oulu, Finland. The video streaming was completed using commercially-available Nokia AirScale base station and Qualcomm Technologies’ 5G NR device prototypes. The multi-streams are stitched together and delivered to our booth in Barcelona. We are connecting the whole experience together for attendees at MWC18 into a virtual reality 5G lab, where they can interact with our team in Oulu. 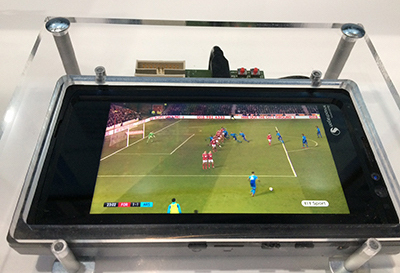 To close the loop to the end user, we have another live 5G demo system at MWC18 where we stream BT Sports video delivered them on a Qualcomm Technologies 5G device. The mobile form factor device is using the Qualcomm® Snapdragon™ X50 5G modem chipset to deliver a multi-gigabit transmission over mmWave spectrum. 5G NR is the only cost efficient radio access technology solution for delivering this level of immersive experience to the masses. With new spectrum opportunities, much higher spectral efficiency, and advanced techniques in interference mitigation and receiver technology, 5G NR will ultimately to transform the sports fan experience. The commercialization of 5G is happening fast and with 5G NR standards testing already up and running, we know that these immersive events are just around the corner.. Check out more on Nokia 5G Stadium and 5G Future X solutions. Follow us at Mobile World Congress 2018 here.